Aortic root aneurysms in young adults are often associated with degenerative changes in the fibrous skeleton of the heart which causes dilatation of the aorto-ventricular junction. This type of degenerative process is also frequently associated with incompetent bicuspid aortic valves. 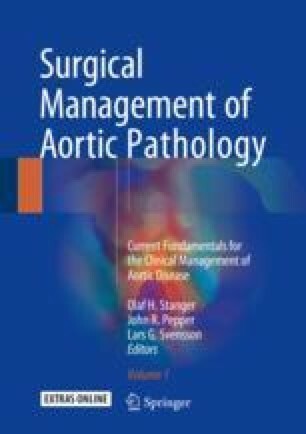 Reimplantation of the aortic valve (David operation) into a cylindrical Dacron graft has proven to be an effective and durable aortic valve-sparing operation in these patients as long as the aortic cusps are normal or minimally stretched. Older patients with aortic root aneurysm and normal aorto-ventricular junction can also be treated by this operation with similarly satisfactory long-term results.